1. 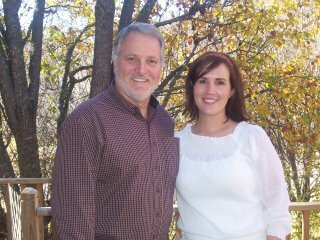 To show off my beautiful niece Shelley Mayfield who is a delightful young lady who lives and works in Nashville, TN. She is a tax accountant who lives in the artsy part of the city near Vanderbilt University. Someday she wants to be the business manager of an art museum, but in the meantime is dreaming of opening an avant garde coffee house in her part of the city. Julie and I had a great time Thanksgiving week visiting with Shelley, with her brothers Jon and Jeff, with Jeff's wife, Kristen and her sons Zachary and Austin, with Shelley's mother, Diane, who is Julie's sister, and with Larry, Diane's husband. It was very special to visit with Shelley's grandmother, Lois, who is Julie and Diane's mother and my mother-in-law. 2. To dispel rumors that I have lost my facial hair (because of the clean-shaven face in the previous post's picture with Julie). I am still sporting a graying, short-cropped beard that expresses the deep and wide-ranging wisdom in my head. [Yeah, sure, John.] When will the rumor mill cease grinding? Now, let's have some left-over turkey and dressing with gravy on it. The Progressive Era was neither progressive nor an era. Discuss! You wrote such nice things. I kept asking Julie, "Is he writing about me?" I do appreciate it. You and Andi are family. Thanks for the cheerful word.